The Surprising Charms Of 'A Discovery Of Witches' While the new hit romance A Discovery Of Witches may seem like it was cooked up as a party game, it's surprisingly good fun — vampires and all. 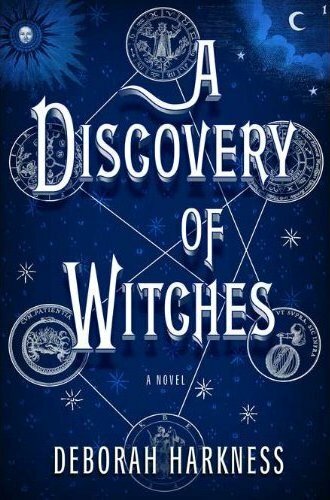 That's what I tweeted about 25 pages into A Discovery of Witches, the fantasy romance that became the number one bestseller in hardcover fiction yesterday before it was even officially released, thanks to terrific buzz and humongous presales. Not only did the cackle shortage suggest a certain humorlessness, but something about A Discovery of Witches seemed contrived. Even cynical. For Pete's sake, it's a book about a witch who falls in love with a vampire ... while uncovering radical secrets that a small, conservative cabal is determined to protect. What, other than cynicism, could draw such a book out of a respected academic who studies the history of science and medicine? I darkly suspected author Deborah Harkness of just following through on the dinner-party game of ginning up ideas for zeitgeist-button pushing bestsellers. "Let's see ... a unicorn in a Depression-era traveling circus run by a vampire!" "Oooh, how about a vampire who's chased by members of a secret Catholic cult through Italy, India and Bali, learning valuable life lessons along the way?" "Nooo, a politically incorrect vampire who was horribly abused as a child rescues a lovable vegan Labrador from Swedish Nazi sympathizers!") This book seemed like that. That the witch and vampire are really into doing yoga? Did not help. A Discovery Of Witches is certainly annoying at the beginning. "What got me away from Madison was my intellect," heroine Diana Bishop smugly pronounces. Her amazing intellect is aided by "a prodigious, photographic memory." That's not all she has going for her, either: Bishop is a Yale professor spending a year at Oxford. She's described as an "extraordinary" actress and a disciplined athlete, and she's constantly rowing or jogging. You sort of want to kick her. But against all odds, A Discovery of Witches becomes increasingly charming as it goes along. There's a fine story here, centered on Bishop's discovery of a manuscript that promises to unleash all sorts of magical mayhem. Harkness tucks in bright plot twists and details based on her studies of the history of science and of really, really good wine. It's a shrewdly written romp and a satisfying snow-day read for those of us who heartily enjoyed the likes of Anne Rice and Marion Zimmer Bradley. By the book's rousing end, I didn't even miss the cackling. In fact, I was impatient for the sequel.